In March 2019, the ICO composite indicator fell by 3.1% to 97.50 US cents/lb, which is the lowest monthly average since October 2006 when the price was 95.53 US cents/lb. Prices for all group indicators fell in March 2019, with Brazilian Naturals registering a decrease of 4.2% to 95.81 US cents/lb, the largest among the four group indicators. Shipments in the first five months of coffee year 2018/19 increased by 6.2% to 52.27 million bags, reflecting the ample supply of coffee on the international market. Shipments of Brazilian Naturals rose by 20.4% to 18.65 million bags, and Colombian Milds grew by 7.7% to 6.63 million bags. World production in coffee year 2018/19 is estimated at 168.05 million bags while consumption is estimated at 164.99 million bags, creating a surplus of 3.06 million bags. This follows a surplus of 4.16 million bags in coffee year 2017/18. �World coffee exports amounted to 10.16 million bags in February 2019, compared with 9.85 million in February 2018. �Exports in the first 5 months of coffee year 2018/19 (Oct/18 to Feb/19) have increased by 6.2% to 52.27 million bags compared to 49.21 million bags in the same period in 2017/18. In February 2019, the ICO composite indicator fell by 0.9% to 100.67 US cents/lb, similar to the level in December 2018. The daily composite indicator reversed the gains made in January, falling from an average of 103.32 US cents/lb in the first week of February to a low of 97.44 US cents/lb on 26 February. Prices for Brazilian Naturals and Colombian Milds registered decreases in February, while Other Milds remained unchanged, and Robusta prices increased 0.5% to 78.65 US cents/lb. Shipments in the first four months of coffee year 2018/19 increased by 6.6% to 41.96 million bags, reflecting the ample supply of coffee on the international market. Exports of all types, except for Other Milds, increased in comparison to the first four months of 2017/18. The difference in the availability of Colombian Mild coffee to Other Milds has resulted in a negative differential of 0.52 US cents/lb for February. � World coffee exports amounted to 11.06 million bags in January 2019, compared with 10.78 million in January 2018. � Exports in the first 4 months of coffee year 2018/19 (Oct/18 to Jan/19) have increased by 6.6% to 41.96 million bags compared to 39.36 million bags in the same period in 2017/18. � In the twelve months ending January 2019, exports of Arabica totalled 78.78 million bags compared to 75.76 million bags last year; whereas Robusta exports amounted to 45.96 million bags compared to 43.66 million bags. In January 2019, the ICO composite indicator rose by 0.9% to 101.56 US cents/lb as prices for all group indicators increased. After starting at a low of 99.16 US cents/lb, the daily composite indicator increased over the remainder of the month to end at a high of 103.58 US cents/lb on 31 January. The average price for Colombian Milds and Other Milds rose by 1.1% to 129.28 US cents/lb and 128.46 US cents/lb, respectively. Prices for Robusta increased by 0.9% to 78.24 US cents/lb while prices for Brazilian Naturals increased by 0.8% to 102.94 US cents/lb. � World coffee exports amounted to 10.43 million bags in December 2018, compared with 10.33 million in December 2017. � Exports in the first 3 months of coffee year 2018/19 (Oct/18 to Dec/18) have increased by 8.1% to 30.91 million bags compared to 28.58 million bags in the same period in 2017/18. � In the twelve months ending December 2018, exports of Arabica totalled 78.63 million bags compared to 75.38 million bags last year; whereas Robusta exports amounted to 45.83 million bags compared to 42.39 million bags. Coffee year 2018/19 is expected to be the second consecutive season of surplus, as global output, estimated at 167.47 million bags, exceeds world consumption, estimated at 165.18 million bags. However, given the stronger growth in demand, the surplus for 2018/19 is projected to be 2.29 million bags, around 1 million bags less than in 2017/18. This excess in supply continues to put downward pressure on prices that will likely continue over the next few months. After a decrease of 1.5% to 109.59 US cents/lb in November 2018, the monthly average of the ICO composite indicator fell sharply to 100.61 US cents/lb in December 2018. Prices for all group indicators declined in December 2018, with the largest decreases for Brazilian Naturals and Colombian Milds, which fell by 9.9% to 102.10 US cents/lb and by 8.2% to 127.86 US cents/lb, respectively. Other Milds decreased by 7.3% to 127.10 US cents/lb, reducing the differential with Colombian Milds to just 0.76 US cents/lb in December 2018. Robusta fell by 7.1% to 77.57 US cents/lb. �World coffee exports amounted to 9.88 million bags in November 2018, compared with 9.35 million in November 2017. �Exports in the first 2 months of coffee year 2018/19 (Oct/18 to Nov/18) have increased by 12.6% to 20.55 million bags compared to 18.24 million bags in the same period in 2017/18. �In the twelve months ending November 2018, exports of Arabica totalled 78.10 million bags compared to 75.57 million bags last year; whereas Robusta exports amounted to 46.16 million bags compared to 42.38 million bags. The monthly average of the ICO composite indicator decreased by 1.5% to 109.59 US cents/lb in November 2018 following the 13.3% increase to 111.21 US cents/lb last month, reflecting the fall in prices for all group indicators. The price for Robusta fell 2.1% to 83.52 US cents/lb, while Brazilian Naturals fell 2% to 113.27 US cents/lb. The differential between Colombian Milds and Other Milds decreased 38.1% to 2.16 US cents/lb, as the monthly average for Colombian Milds fell by 1.1% to 139.27 US cents/lb, compared to a decrease of 0.2% to 137.11 US cents/lb for Other Milds. In coffee year 2017/18, global output, estimated at 163.51 million bags, exceeded world consumption, estimated at 161.93 million bags, by 1.59 million bags. This excess in supply has put downward pressure on prices that may continue over the next few months. The increase in supply is also reflected in the export data. World coffee exports increased by 17% to 10.41 million bags in October 2018, compared with 8.89 million in October 2017. In the twelve months ending October 2018, global shipments amounted to 123.5 million bags, 4.2% higher than last year. The ICO�s Executive Director, Mr Jos� Sette, attended the 58th General Assembly of the Inter-African Coffee Organization (IACO) in Libreville, Gabon last week. In his speech at the Opening Ceremony he stressed the importance of the work of multilateral organizations, like IACO, in the coffee sector. Africa - the birthplace of coffee, is a continent of great challenges, but also great potential. � World coffee exports amounted to 10.41 million bags in October 2018, compared with 8.90 million in October 2017. � In the twelve months ending October 2018, exports of Arabica totalled 77.56 million bags compared to 75.74 million bags last year; whereas Robusta exports amounted to 45.95 million bags compared to 42.77 million bags..
Total coffee exports increased each year since 2010/11 with a new record reached in 2017/18 at 121.86 million bags, 2% higher than 2016/17. In the twelve months ending September 2018, exports of green Arabica totalled 70.95 million bags compared to 70.51 million bags last year; whereas green Robusta exports amounted to 39.24 million bags compared to 38.87 million bags. Total shipments of all forms of coffee increased in four out of the ten largest exporters for coffee year 2017/18, including the two largest, Brazil and Vietnam. World coffee consumption is provisionally estimated at 161.93 million bags in coffee year 2017/18, led by an increase of 3.1% to 35.9 million bags in Asia & Oceania�s consumption. While coffee consumption is estimated 1.8% higher in coffee year 2017/18, coffee production exceeded this by 1.59 million bags. This surplus and the higher volume of shipments contributed to the low prices in 2017/18. � World coffee exports amounted to 9.43 million bags in September 2018, compared with 8.75 million in September 2017. � Exports in coffee year 2017/18 (Oct/17 to Sep/18) have increased by 2% to 121.88 million bags compared to 119.52 million bags in the last coffee year. � In the twelve months ending September 2018, exports of Arabica totalled 76.66 million bags compared to 76.08 million bags last year; whereas Robusta exports amounted to 45.22 million bags compared to 43.44 million bags. The Executive Director, Mr Jos� Sette, was honoured to welcome His Excellency Mr Rui Jorge Carneiro Mangueira, who on 24 October visited the ICO for the first time since taking up his post as Ambassador of Angola to the United Kingdom. Coffee market ends 2017/18 in surplus World coffee production in coffee year 2017/18 is estimated 5.7% higher at 164.81 million bags as output of Arabica increased by 2.2% to 101.82, and Robusta grew 11.7% to 62.99 million bags. The larger supply in coffee year 2017/18 is reflected in increased shipments in August 2018, as global exports increased 6.3% to 11.1 million bags compared to August 2017. In coffee year 2017/18, world consumption is estimated 1.8% higher at 162.23 million bags, but coffee production exceeds this by 2.58 million bags. This surplus has contributed to the low prices this season. The ICO composite indicator fell to 98.17 US cents/lb in September 2018, 4.1% lower than in August 2018, the lowest monthly average since October 2006 when it reached 95.53 US cents/lb. Prices for all group indicators fell for the fourth consecutive month in September 2018. The largest decrease occurred in the average price for Robusta, which fell by 5% to 76.70 US cents/lb followed by a decline of 4.4% to 99.87 US cents/lb for Brazilian Naturals. � World coffee exports amounted to 11.10 million bags in August 2018, compared with 10.44 million in August 2017. � Exports in the first 11 months of coffee year 2017/18 (Oct/17 to Aug/18) have increased by 1.6% to 112.52 million bags compared to 110.77 million bags in the same period in the last coffee year. � In the twelve months ending August 2018, exports of Arabica totalled 76.24 million bags compared to 76.39 million bags last year; whereas Robusta exports amounted to 45.02 million bags compared to 44.14 million bags. International coffee prices have been experiencing a downward trend in the last two years, averaging 102.41 US cents/lb in August 2018, a 20.1% drop compared to August 2017. The last time the monthly composite indicator price was lower than 102.41 US cents/lb was in November 2013, when it recorded 100.99 US cents/lb. This decline is linked primarily to market fundamentals, though other factors, such as exchange rate movements and futures markets, are also playing a role. Total exports in July 2018 amounted to 10.11 million bags in July 2018, compared with 9.66 million in July 2017. Exports in the first 10 months of coffee year 2017/18 (Oct/17 to Jul/18) have increased by 0.9% to 101.2 million bags, compared to 100.34 million bags in the same period in the last coffee year. � World coffee exports amounted to 10.11 million bags in July 2018, compared with 9.66 million in July 2017. � Exports in the first 10 months of coffee year 2017/18 (Oct/17 to Jul/18) have increased by 0.9% to 101.2 million bags compared to 100.34 million bags in the same period in the last coffee year. � In the twelve months ending July 2018, exports of Arabica totalled 75.63 million bags compared to 76.6 million bags last year; whereas Robusta exports amounted to 44.76 million bags compared to 44.27 million bags. 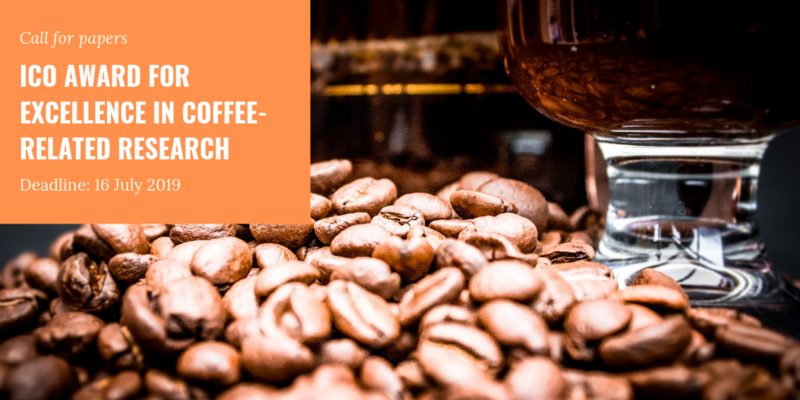 The International Coffee Organisation and the Sustainable Coffee Challenge are pleased to announce the publication of the Guide to Access Green and Climate Funding for the Coffee Sector: The Global Environment Facility (GEF). This new Guide seeks to assist governments of coffee-producing countries to access GEF funding in order to address coffee sector challenges. In July 2018, the ICO composite indicator price decreased by 2.9% to an average of 107.20 US cents/lb, which is the lowest monthly average for July since 2007, when the monthly composite indicator reached 106.20 US cents/lb. Prices for all coffee groups fell in July 2018, though the largest month-on-month decrease occurred for Brazilian Naturals, which declined by 4% to 110.54 US cents/lb. Total exports in June 2018 amounted to 10.45 million bags, 2.6% higher than in the same month one year ago, led by an increase of 7.9% to 3.95 million bags for Robusta. However, total Arabica shipments in June 2018 fell by 0.4%, to 6.51 million bags, with exports of Colombian Milds growing by 1.1%, to 1.03 million bags, and Brazilian Naturals by 2.2%, to 2.61 million bags. Other Milds fell by 3.2%, to 2.87 million bags. � World coffee exports amounted to 10.45 million bags in June 2018, compared with 10.19 million in June 2017. � Exports in the first 9 months of coffee year 2017/18 (Oct/17 to Jun/18) have increased by 0.3% to 90.86 million bags compared to 90.55 million bags in the same period in the last coffee year. � In the twelve months ending June 2018, exports of Arabica totalled 75.08 million bags compared to 75.46 million bags last year; whereas Robusta exports amounted to 44.55 million bags compared to 44.05 million bags. In June 2018, the ICO composite indicator decreased by 2.6% to an average of 110.44 US cents/lb, which is the lowest monthly average since December 2013. Prices for all coffee groups fell in June 2018, though the largest month-on-month decrease occurred for Brazilian Naturals, which declined by 3.7% to 115.10 US cents/lb. Global coffee production in 2017/18 is estimated at 158.56 million bags, 0.3% lower than in 2016/17. World exports amounted to 9.27 million bags in May 2018, compared with 10.59 million bags in May 2017, driven by a 32.5% decrease for shipments from Brazil, 25.7% for shipments from Honduras, and 55.2% for shipments from Indonesia. �	World coffee exports amounted to 9.27 million bags in May 2018, compared with 10.58 million in May 2017. �	Exports in the first 8 months of coffee year 2017/18 (Oct/17 to May/18) have decreased by 0.5% to 79.94 million bags compared to 80.35 million bags for the same period in the last coffee year. �	In the twelve months ending May 2018, exports of Arabica totalled 74.72 million bags compared to 74.80 million bags last year; whereas Robusta exports amounted to 44.19 million bags compared to 44.42 million bags. In May 2018, the ICO composite indicator increased by 0.7% to an average of 113.34 US cents/lb, following three months of declines. Prices for all coffee groups rose in May 2018, though the largest month-on-month increase occurred for Other Milds, which grew by 0.9% to 135.61 US cents/lb. Global coffee exports amounted to 10.18 million bags in April 2018, compared with 9.50 million in April 2017, driven by an increase of 14.1% for Robusta shipments and 6.8% for Colombian Milds. World production in 2017/18 is estimated 1.2% higher at 159.66 million bags with output expected to grow in eight of the ten largest coffee-producing countries. � World coffee exports amounted to 10.18 million bags in April 2018, compared with 9.5 million in April 2017. � Exports in the first 7 months of coffee year 2017/18 (Oct/17 to Apr/18) have increased by 1.2% to 70.65 million bags compared to 69.78 million bags in the same period in the last coffee year. � In the twelve months ending April 2018, exports of Arabica totalled 75.93 million bags compared to 74.08 million bags last year; whereas Robusta exports amounted to 44.32 million bags compared to 44.63 million bags. In April 2018, the ICO composite indicator decreased by 0.4% to an average of 112.56 US cents/lb, with the daily price ranging between 110.49 US cents/lb and 114.73 US cents/lb. Prices for all three Arabica groups fell in April 2018, though the largest month-on-month decrease occurred for Brazilian Naturals, which fell by 0.9% to 118.76 US cents/lb. The monthly average for Robusta, on the other hand, increased by 0.1% to 88.31 US cents/lb. Global coffee exports amounted to 10.81 million bags in March 2018, compared with 10.91 million in March 2017, driven by decreased shipments of Arabica, particularly Colombian Milds. Exports in the first six months of coffee year 2017/18 decreased by 0.6% to 59.96 million bags compared to the same period in the last coffee year. � World coffee exports amounted to 10.81 million bags in March 2018, compared with 10.91 million in March 2017. � Exports in the first 6 months of coffee year 2017/18 (Oct/17 to Mar/18) have decreased by 0.6% to 59.96 million bags compared to 60.32 million bags in the same period in the last coffee year. � In the twelve months ending March 2018, exports of Arabica totalled 75.32 million bags compared to 74.05 million bags last year; whereas Robusta exports amounted to 43.62 million bags compared to 45.47 million bags. Since August 2017, the ICO composite indicator price has declined in each month except January 2018. The composite indicator decreased by 1.1% in March 2018 to an average of 112.99 US cents/lb, which is the lowest monthly price since February 2016. Indicator prices for all groups fell in March 2018, though the largest month-on-month decrease occurred for Colombian Milds, which fell by 1.4% to 139.45 US cents/lb. This narrowed the price differential between Colombian Milds and Other Milds to an average of 4.42 US cents/lb, 15.3% lower than last month. Global production is estimated at 159.66 million bags in 2017/18, 1.2% higher than 2016/17, resulting in an estimated surplus of 0.78 million bags. Arabica production is estimated 4.6% lower at 97.43 million bags while Robusta is estimated 12.1% higher at 62.24 million bags. The surplus in production is reflected in increased shipments for all groups, except Colombian Milds, during the first five months of coffee year 2017/18. � World coffee exports amounted to 9.93 million bags in February 2018, compared with 9.89 million in February 2017. � Exports in the first 5 months of coffee year 2017/18 (Oct/17 to Feb/18) have increased by 3.2% to 50.98 million bags compared to 49.41 million bags in the same period in the last coffee year. � In the twelve months ending February 2018, exports of Arabica totalled 77.71 million bags compared to 73.97 million bags last year; whereas Robusta exports amounted to 45.53 million bags compared to 45.68 million bags. On 9 March 2018, the Executive Director, Mr Jos� Sette, was honoured to welcome His Excellency Mr Alexandre Fasel, who visited the offices of the ICO for the first time since taking up his post as Ambassador of Switzerland to the United Kingdom. Accompanied by First Secretary, Ms Stefanie K�ng, Ambassador Fasel met with senior members of the ICO team to discuss the challenges and opportunities for the coffee sector, including the need to foster sustainability to address quality, safety and productivity issues, climate change, gender and small growers� needs. A new approach to project development and funding being developed by the ICO was also discussed at length. In celebration of women�s achievements in coffee and to encourage the wider participation of women in all aspects of the coffee industry, we are delighted to announce that this year we will be focusing on �Women in coffee� as the theme for International Coffee Day on 1 October, as well as in our wider work programme. It is in all our interests to empower women in the international coffee community. We look forward to working with our Members and partners to help make this happen.